New! Free LinkedIn Account Review! Executive resumes, resume services, networking resumes, job proposals, social media, LinkedIn profiles, ATS-compliant resumes, personal branding statements, electronic resumes, resume revisions, job search strategies, Resumix, military resume conversions, KSAs, SES packages, government job searches, federal resumes, cover letters, thank you letters, online postings, online searches, salary negotiations, interviewing techniques, and career change resumes. We provide a full range of resume services. Corporate headquarters in Tampa, Florida with satellite locations in Atlantic County, New Jersey, and San Diego, California. Our on-staff team of Certified Professional Resume Writers (CPRWs) have been writing professional resumes since 1996. We are excited about the recent addition of one Certified Career Coach (CCC) and one technical and social media expert! We can now take care of your entire career needs, to include one-on-one career coaching. The addition of a technical and social media expert ensures that your LinkedIn and social media accounts will be cutting edge. We now offer his expertise in Excel spreadsheets and PowerPoint presentations. For pricing, please text Carol at 813-508-6241. We are committed to provide you with the best possible services; be it a resume, LinkedIn, or coaching on how to conduct an effective job search campaign. Our success depends on your success!! Our resumes are the gold standard of resume services, to include executive resumes, executive bios, executive packages which includes your executive resume plus a one-page synopsis / snapshot of your career, cover letters, job search strategies, resume revisions, and resources to assist you in ensuring your resume gets an interview. Our professionally written resumes have been published in 9 nationwide books. These published professional resumes are examples on how to write resumes to secure an interview and turn it into a job offer. We also offer social media options, scannable resumes, targeted resumes, targeted cover letters, electronic resumes, and resumes formatted to meet today’s Applicant Tracking Systems. 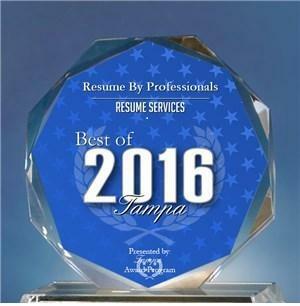 Our firm is customer-focused and committed to providing you with the best resume written for your unique job situation. As Certified Professional Resume Writers, our clients seek our professional advice on ways to improve their job search efforts and results, as well as new ways to market themselves and improve visibility. We have been in this industry for 22 years and have seen resumes evolve from the old-fashioned, typewritten ones (which included social security number, hobbies, etc.) to high-quality printed, presentation folder style, pdf version, and now email attachment versions. Resumes are poised to evolve once again, and we want our clients to lead the way and be ahead of their competition in what we call the "resumes of the future." A business-oriented social networking site used primarily for professional networking. Launched in 2003, it currently has more than 500 million users in 200 countries worldwide. We will partner with you to establish a LinkedInTM account. The principal function of ATS software is to provide a central location and database for a company's recruitment efforts. It is designed to help a company, recruiter, or online job board more efficiently recruit employees (through parsing the required information and entering it into a database). It is estimated that 50% of all mid-sized companies and almost all large corporations use some type of ATS. To be scanned and parsed correctly, your resume needs to be in a specific format for the ATS software to extract the necessary information according to the requirements of the company (i.e., company name, skill set, key words). The majority of job and resume boards (Monster, Hotjobs, Career Builder) have partnerships with ATS software providers to provide parsing support and ease of data migration from one system to another. Modern ATSs allow applicants to be sourced from the company's own database of past job applicants. with you to create a LinkedIn profile to maximize your job search. It is not a luxury anymore - it is a necessity! Invest in your career - it will pay big dividends! To keep up with today's competitive job market, you need to have your resume professionally written. For every job opening posted, it is not unusual for companies to receive in excess of 300 resumes for that position. That is your competition. Are you confident that your resume will be one of the "top ten" resumes that company receives? It needs to be if you want to get that interview. If the unemployment rate is 10.5%, 89.5% of the population is working!!!!! Let us help you be one of that 89.5%. We have been writing powerful resumes since 1989, are well respected in our industry, and have guaranteed results. You are not just a number to us; we care if you succeed. Call today and speak with one of our Certified Professional Resume Writers (CPRW). We will discuss your specific needs and answer any questions you may have. All our resumes are written by CPRWs. CALL US TO DISCUSS YOUR CAREER NEEDS!